Mirabai is a literary and spiritual figure of legendary proportions. Born a princess in the region of Rajasthan in 1498, Mira (as she is more commonly known) fought tradition and celebrated a woman’s right to an independent life in her ecstatic poems. Her royal family arranged an early marriage for her, but she felt a marriage to Krishna was more important. As a result, her life became a model of social defiance and spiritual integrity. During her lifetime, Mira’s reputation spread across her country. She was known as a woman of immense talent and devotion. By the time she died in 1550, she was considered a saint. People across India recited and danced to her poems, and they still do today. 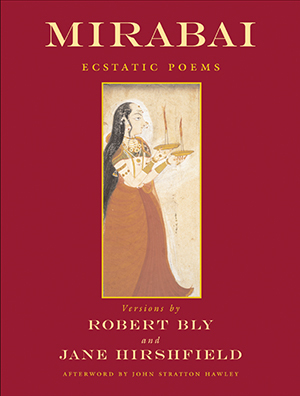 In this collection, Robert Bly and Jane Hirshfield, two of America’s best poets, have created lively English versions of Mirabai’s poems, using fresh images and energetic rhythms to make them accessible to modern readers. Their work makes clear that Mirabai’s poetry transcends her time and culture. Columbia University professor of religion John Stratton Hawley provides an afterword to the volume that discusses what is known of Mirabai’s life and reputation. With a historian’s precision, he shows how Bly and Hirshfield’s versions belong to a tradition of reinterpretation and rephrasing that is already centuries old. Mirabai comes to life through the impressive interpreting of her poems by Bly and Hirshfield. The poems feel as fresh today as they must have felt when this amazing woman sung them herself five centuries ago.